^ "Emirates aircraft cover 432 million kilometres across the globe in six months". Emirates.com. 28 July 2016. Retrieved 18 January 2018. ^ "Domestic bliss - The world's largest airlines". Economist.com. 24 June 2015. Retrieved 18 January 2018. ^ "Emirates Executive". Emirates Executive. Retrieved 22 February 2018. ^ "Emirates Airlines featuring Jennifer Aniston !". YouTube. 5 October 2015. Retrieved 18 January 2018. ^ "YouTube". YouTube. Retrieved 18 January 2018. ^ "Boeing Launches 777X with Record-Breaking Orders and Commitments" (Press release). Boeing. 17 November 2013. ^ Shweta Jain (4 October 2017). "Emirates will be first airline to receive 777X, says Boeing". Gulf News Aviation. ^ "Emirates places US$15.1 billion order for 40 Boeing 787 Dreamliners at 2017 Dubai Airshow". www.emirates.com. Retrieved 10 March 2019. ^ "Emirates First Class Cabins inspired by Mercedes-Benz S-Class - Boeing 777". Beyondbusinesstravel.com. 28 November 2017. Retrieved 18 January 2018. ^ "Emirates' new Boeing 777 first class suites: what we know so far - Australian Business Traveller". Ausbt.com.au. Retrieved 18 January 2018. ^ 12 Nov 2017 by Tom Otley (12 November 2017). 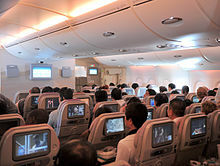 "Emirates reveals new cabins for Boeing B777 fleet - Business Traveller – The leading magazine for frequent flyers". Businesstraveller.com. Retrieved 18 January 2018. ^ "Emirates hints at design of new A380 first class suites". Australian Business Traveller. Retrieved 6 April 2017. ^ "Book flights with Virgin Atlantic" (PDF). Virgin-atlantic.com. Retrieved 18 January 2018. ^ "Chauffeur-drive | The Emirates Experience | Emirates". 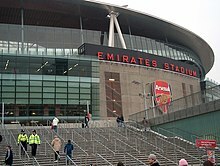 Emirates. Retrieved 2 May 2017. ^ "History | About Emirates | Emirates". Emirates. Retrieved 20 February 2017. ^ "Skywards | Emirates Airline". Emirates Airline. Retrieved 20 February 2017. 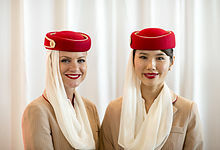 ^ "Our Partners | Emirates Skywards | Emirates". Emirates. Retrieved 20 February 2017. ^ "See more world with Cash+Miles | Emirates Skywards | Emirates". Emirates. Retrieved 20 February 2017.